Lines for coffee at the Cafe were pretty long this morning and I missed my opportunity to have breakfast to do some work. But eventually made my way to the press room and got some food and coffee. Spent the morning in Analyst sessions mostly under NDA but it seems safe to say that EMC sees plenty of opportunity ahead. The first session Q&A with BRS executives and customers was enlightening but the main message from the customers was that data protection is hard, legacy systems often can’t adjust quick enough and sometimes a completely new architecture is warranted. The executives were upbeat about current BRS business and where they were headed in the future. Rest of the morning was with Jeremy Burton EVP Product, Operations and Marketing and John Roese, the new SVP and CTO of EMC (6 months on the job). Jeremy talked about an IDC insight that there’s a new world emerging so-called 3rd platform applications based on mobile and consumer grade technology with literally billions of users, millions of apps built on mobile-cloud-bigdata-social infrastructure which complements the 2nd platform built on lan/wan, client server frameworks. For an example of this environment Jeremy mentioned that AT&T provisions 12PB of storage a month. John comes by way of Huawei, Nortel and myriad others and offers a broad insight to the way forward for EMC. It looks like a bright future ahead if they can do half of what John has outlined. The amount of information they gather is frightening they know everything about you. Pivotal will be the key here because its good at 1) ability to correlate information across different information sources. Most carriers have a whole bunch of disparate information stores; and 2) It’s not just focused on Big Data as a non-realtime problem but also provides realtime analytics as well. Capital costs are going down but $/bits are going way down. VMware & Software defined data center is the right way to drive down costs. Today servers are ~50% virtualized but networking is not virtualized at all. Customers are dissatisfied with service providers (carriers). Again Pivotal is key here. One carrier customer was focused on customer churn and tried to figure out how to minimize this. They used Gemfire’ high speed infrastructure that could watchc all transactions on cell tower infrastructure pick out dropped calls, send it to Greenplum and correlate this with the customer attributes (good or bad), and within 100msec supply an interaction with the customer in to apologize and offer some services to make it better. Internet is the new wild west –use at your own risk, spoofing websites, respond to email could be anyone, chaos to security. RSA can become the trusted internet provider by looking at the internet holistically, combining information from many customers, aggregating and sharing these interactions to deterimine the trust of every transaction. Trust is becoming a new big data problem. Hybrid and public cloud is their biggest opportunity but they don’t know how to attack it. VMware and SDDC will evolve to provide orchestrated movement from private to public and closed to open. The thinking seems pretty straightforward given what they are trying to accomplish and the framework he applied to EMC’s strategy going forward made a lot of sense. 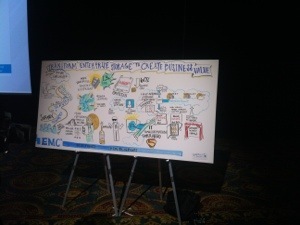 Brian Gallagher did a keynote on enterprise storage new functions and features which covered VMAX, VPLEX, RecoverPoint, and XtremIO/SF/SW. Mentioned RecoverPoint virtual appliance and sort of a statement of direction on being able to move application functionality directly on VMAX. He kind of demoed this with VPLEX running on VMAX. He also talked about FAST speed of reaction versus the competition, mentioned that FAST provides information about the storage tiering to up to 4 different VMAX arrays. Showed a comparison of VMAX 10K against another prime competitor that looked downright embarrassing. 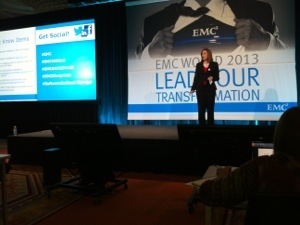 And talked about VMAX cloud edition. After that 1 on 1 meetings all under strict NDA. 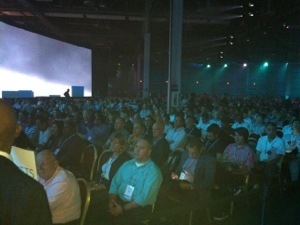 But then the big Keynote with Jeremy again and David Goulden President and COO on ViPR. They have implemented software defined storage (SDS). Last week I did a post on SDS trying to layout some of the problems and promises of SDS (please see The promise of SDS post). But what I missed was the data path transformation that ViPR can do to provide object and HDFS access to traditional and commodity storage systems. ViPR starts out primarily in the control layer providing automated provisioning, self management, across heterogeneous storage pools. With ViPR one can define virtual storage arrays and then configure virtual storage pools across those arrays regardless of the physical infrastructure underneath them. More on ViPR in a separate post but suffice it to say EMC has been working on this for awhile now. But how it’s positioned with VPLEX and the other storage virtualization capabilities in VMAX and other products is another matter. But it seems they are carving out a space for ViPR between and above the current storage solutions. End of day one is in the Expo and then cocktail parties… stay tuned for day 2.